Successfully Added Ultrasonic Cleaner VGT-2000 - 5 Cycles, 40kHz, 600ml Tank, Digital Display to your Shopping Cart. The VGT-2000 brings fast efficient cleaning at the push of a button. The ultrasonic cleaner uses ultrasound at a 40kHz frequency. This creates sonic pressure in the water or chosen cleaning solvent. These ultrasonic waves create microbubbles which gently remove dirt and contamination. These tiny bubbles can penetrate even microscopic crevices and clean them thoroughly. 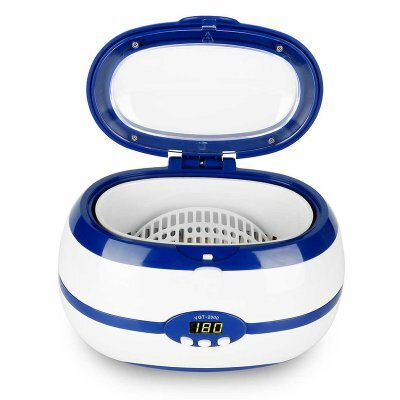 So you won't have to spend hours polishing the silver or cleaning your jewelry as this ultrasonic cleaner does in seconds what would normally take you hours. Ultrasonic cleaners are the professional way to clean a whole host of objects. Jewelry, lenses, optical parts, dental and surgical tools as well as coins, firearms parts, and airbrushes to name just a few. With a 600ml (1 pint) tank the VGT-2000 Ultrasonic cleaner is suitable for cleaning many household and personal objects. The 5 cycles are displayed digitally and let you select a cleaning time from 90 seconds to 8 minutes. A plastic basket, as well as watch/bracelet holder, are included to ensure thorough cleaning when used with small pieces. This ultrasonic cleaner comes with 12 months warranty, brought to you by the leader in electronic devices as well as wholesale cool gadgets..
Timer: 5 cycles: 90Sec, 180Sec, 280Sec, 380Sec, 480Sec. Not recommended for use with items that can be discoloured, waterlogged, or damages easily. Loose delicate or inlaid items may become dislodged by ultrasonic vibrations. For example Semi-precious stones, cloth items, leather products, costume jewellery or soft stones like pearls, opals, turquoise, coral, emeralds etc.